Ever feel like you’ve won the lottery when you (finally) get a chance to travel to a new country? If only you had some kind of cool thing to help you complete the experience. Now with this world scratch map you can do just that. Er, but without the winning a million dollars and being set for life thing though lol. Still, it’s a pretty neat idea. I came across this traveler’s map on Amazon the other day and was immediately drawn in by it. The map is called, fittingly, Scratch Map. It comes in a little protective tube and is small enough so that you can actually even take it with you on your trips if you want. On the back of the map there’s a black and white line drawing style map of the world, along with little boxes and blank lines to fill in. 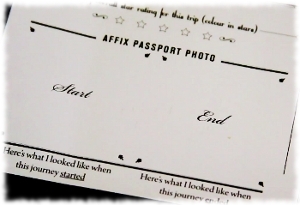 This is meant to be a place for you to do things like ‘draw your flight paths’ and place passport photos, etc. I’m not sure how useful that would be, especially if you plan on hanging up the map someday. The front of the map is the most interesting part of it by far, and I think it would be a cool conversation piece. 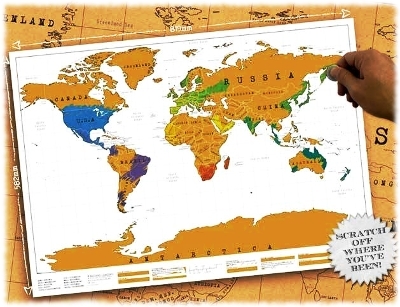 Whether you want to pack the Scratch Map with you on your travels and scratch off each new place as you go …or keep it at home and ceremoniously scratch off the country when you get back, the Scratch Map seems like a pretty cool way to keep track of your travels. As for me, I’m betting if I got this map a trip to Antarctica would happen not long afterwards…just so I could scratch off the biggest area on the map :p.